Public urged to understand TRO on contraceptives | ALLiance for the Family Foundation Philippines Inc.
MANILA – In response President Rodrigo Duterte’s statement regarding the RH Law during his second State of the Nation Address (SONA), an alliance of pro-life and pro-family groups challenged the government to disclose to the public the whole truth about contraceptives, calling on citizens to know the basics behind the Supreme Court (SC)’s resolution to uphold the Temporary Restraining Order (TRO) on the RH Law. 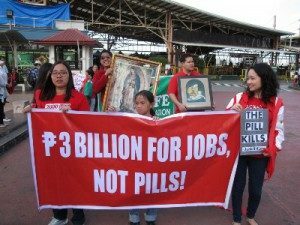 The Alliance for the Family Foundation Philippines (ALFI), in a statement in its Facebook page, expressed its support for the SC’s decision to freeze the distribution of contraceptive drugs and devices, which are under the suspicion of being abortifacient and unsafe for women’s health. The Special Second Division of the Supreme Court, in a Resolution on April 26, 2017, unanimously affirmed its decision of Aug. 24, 2016, ordering the Food and Drug Administration (FDA) to consider the oppositions filed by ALFI with respect to the listed drugs, including Implanon and Implanon NXT. “With this resolution the SC ordered the FDA to: (a) conduct the necessary hearings to determine not only the safety but also the non-abortifacience of contraceptive drugs and devices, and (b) to observe the requirements of due process in the said hearings,” ALFI’s statement explained. In line with this, the group then called on like-minded professionals to offer their services to solidify the case against abortifacient drugs and devices. “We are calling on pro-life doctors and pharmacists and other pro-lifers in related fields to share their expertise, knowledge, time, and effort. This is a very crucial opportunity to bring out the truth once and for all,” appealed ALFI president and legal counsel, Atty. Maria Concepcion S. Noche. According to the pro-life lawyer, the FDA where medical and pharmacological evidence will be presented is “the new battleground”. “The FDA proceedings are most crucial and we have to continue to be vigilant. FDA is mandated to observe due process and to ensure that the proceedings are transparent. It is up to us to hold them to their mandate,” she stressed. Presently, ALFI is preparing for FDA hearings by compiling evidence in the form of scientific journals, treatises, and testimonies from expert witnesses to prove the abortifacient nature of many contraceptives and devices sold commercially in the Philippines and promoted by the state through public health services.